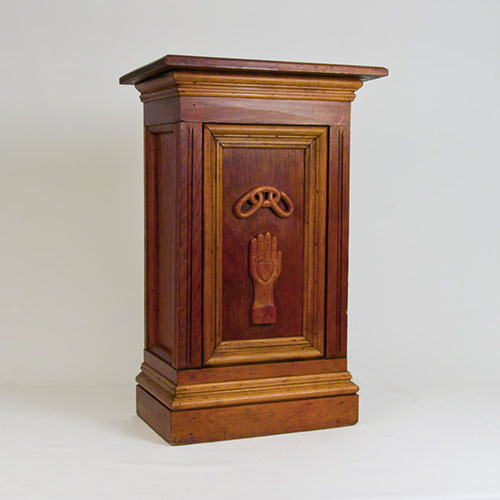 This old Odd Fellows lectern or stand, with carved relief symbols, is the perfect height to display a favorite object or a beautiful fern. We purchased it in the 80s from an antique dealer in Lebanon, Ohio who was a collector of secret society relics and oddities.The warmth of the honey toned stained oak and perhaps some yellow pine detail glows. It also has character derived from the carved symbols particularly the heart and hand suggesting its original use at an Odd Fellows lodge. If this cool vintage piece requires a function, it would be as a shallow bowl or a wall plaque (has tiny hole for brass screw.) But one would probably prefer to see it unencumbered with its hip, de-bossed, symbology for the twelve signs of the zodiac and their affiliated planetary signs. The sun and moon are also rendered centrally. 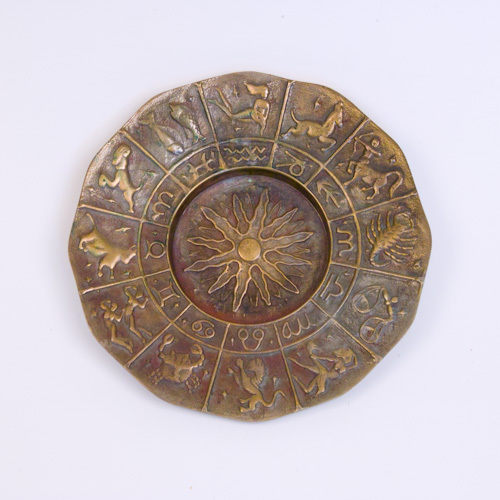 The 8″ diameter piece is marked “Korea” and was originally cast in a beautiful pinkish brass. Super hip piece! We are attracted to good design in all forms. 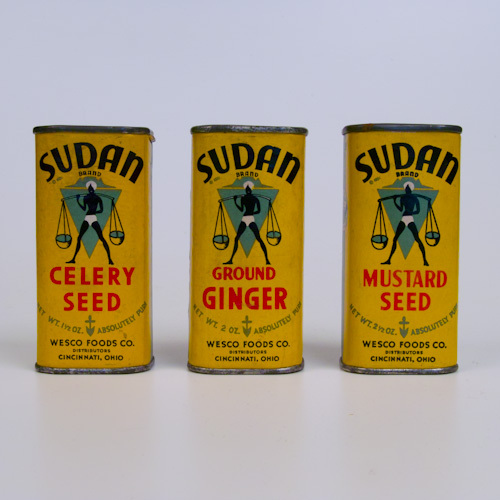 These three Sudan spice “tins” are an early example of packaging design and branding. They are from Wesco Foods, Cincinnati, Ohio. Discovered with some spice still inside, they are in excellent vintage condition, the printed dense cardboard containers with removable “pry” tin tops are for ginger, mustard, and celery seed. The graphics, including Genie type man with balance scales on his shoulders and colors including golden yellow and bright green with black accent make great display pieces for those with interest in graphic design, packaging, or cooking. Identifiable marks date these tins from 1931. 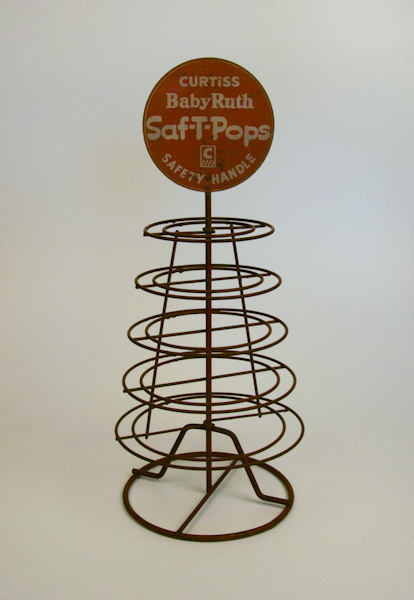 Original and great vintage condition this painted metal Curtiss Baby Ruth Saf T Pops is an early advertising display rack for the counter. It has nice vintage “red” paint with very clean graphics and lines, including five concentric circles. Great display piece for your office or home particularly if you are interested in graphics or marketing. 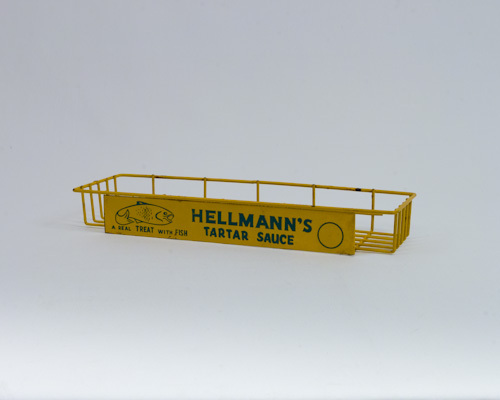 This vintage yellow metal Hellmann’s grocery display has not lost any of its charm or possible creative function. It is a welded metal grid basket with original yellow paint finish and slogan, ” a real treat with fish” showing a leaping fish and spot for the price. It really is perfect for movable storage in your kitchen or whimsically displayed on your book shelves or desk.